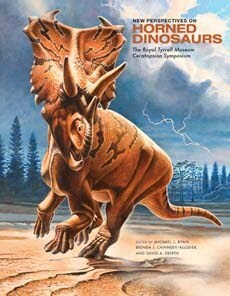 When Pigs Fly Returns: Ceratopsian Volume Out Today!!! EXCITING NEWS, EVERYBODY! As it turns out, we were all wrong about the constant delays! Yeah, we thought it was coming out on April 5th, then I told you recently that the publisher told me that it's actually been delayed until June 2nd, but GUESS WHAT? It's out NOW! And even BETTER, the first twenty people who order the book online will get it for FREE as an apology for the perpetual delays! I had considered doing a post about some fake new fossil that proves BAND right after all, and that birds actually evolved from casids or something, but that would've been MORE plausible. April Fool's, everybody!